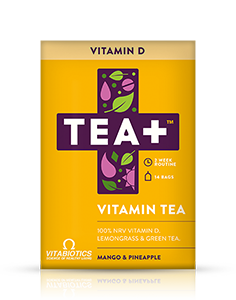 Green Tea, Natural Flavouring, Apple Pieces, Vitamin C, Milk Thistle (2%), Ginger Root (2%), Selenium, Vitamin B complex [ Biotin, Niacinamide, Pantothenic Acid, Vitamin B2, Vitamin B6, Vitamin B1, Folic Acid, Vitamin B12, Mannitol*(wheat)], Dandelion Root (1%). Allergy Advice: For allergens, see ingredients in bold. How often should you drink TEA+ Cleanse? Is TEA+ Cleanse safe for those with a gluten intolerance? Is TEA+ Cleanse suitable for vegetarians and vegans? Does TEA+ Cleanse replace my daily multivitamin? We recommend drinking at least one cup of TEA+ Cleanse per day as part of a healthy lifestyle. The recommended daily limit is 5 servings (200ml per serving). 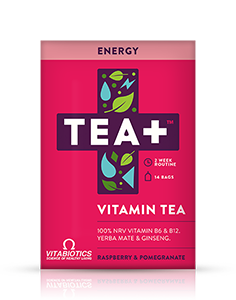 All of our teas have been developed and independently tested to take the known effect of boiling water on vitamins into account to ensure you get the required dosage in every cup when infused for 3 minutes. TEA+ Cleanse contains Mannitol, which is derived from corn, which is a part of our blend. However, the tea is categorised as gluten free under EU regulation. The content of the wheat is in such a small quantity that it is below 20 PPM (parts per million) which constitutes safe for those following a gluten free diet and coeliacs. TEA+ is suitable for vegetarians and vegans as approved by the Vegetarian Society. TEA+ Defence provides B complex, vitamin C and selenium. If you wish to take additional multivitamin supplements, the extra vitamin and mineral content would be within safe levels.